Entry is into a spacious bar area with plenty of seating. There's a table-service restaurant area to the left of the bar, and a beer garden out the back. Kake visited on a Tuesday lunchtime in August 2013. When I arrived around 12:15pm there were a couple of other customers in the restaurant area and one other in just for a drink. Reggae was playing, quite quietly. Service at the bar was friendly, chatty, welcoming, and informative. They were in the middle of a cider festival photo of poster, with the ciders/perries on at the time being Westons Twist Raspberry, Westons Rosie's Pig, Thatchers Heritage, and Gwynt Y Ddraig Two Trees Perry. They also had real ales on: Sambrooks Wandle, BHB Cosmic, Sharp's Doom Bar, and Brakspear Bitter. Despite this richness of choice, I had a pint of lime and soda at a pleasingly cheap 65p. According to their website as of August 2013, Thai food is served noon-4pm and 6pm-10:30pm Mon-Fri, noon-10:30pm Sat, and noon-10pm Sun. 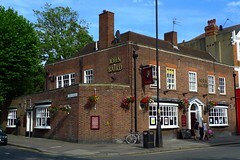 It's provided by The Black Orchid, who also do the food at the Waggon in Southgate. Kake took advantage of their express lunch menu photo 1, photo 2, which offered two courses from £6.45. I chose the vegetable spring rolls to start and the Thai basil and pork stirfry with jasmine rice to follow. Both were served on the same plate photo, in slightly smaller portions than I'd expected but nevertheless a reasonable enough lunch. The spring rolls were crisp and greaseless, the rice was cooked very nicely with no residual starchiness, and the pork actually tasted of pork. The spice level was reasonable for pub Thai; not too challenging, but building gently over time. According to their website as of August 2013, there are two quiz nights: a "serious" one on Thursdays and a "fun" one on Sundays. According to a sign seen in the pub as of the same month, the Thursday quiz starts at 8:30pm. Accessibility: A small step to get in (no more than kerb height). Once you're in, it's step-free to the ladies' toilet and the accessible toilet (didn't check the gents'). Last visited by Kake, August 2013. Opening times taken from the John Baird website, August 2013. Last edited 2018-11-10 14:08:33 (version 15; diff). List all versions. Page last edited 2018-11-10 14:08:33 (version 15).